Last year, Bengaluru began one section of its Namma metro service in the east-west corridor, carrying 100,000 commuters a day, giving an escape from the overcrowded Bangalore roads. The city breathed a sigh of relief! Bengaluru has an underlying association with constant traffic. Its traffic-choked roads have seen the addition of roughly 500,000 vehicles in every financial year. In 2016-17, the total number of vehicles in the city crossed the 60-lakh mark. With an increasing number of private vehicles hitting the roads in a city that can barely handle existing traffic, the metro is expected to give some respite to regular commuters. According to the RTO Karnataka lists, 61,08,936 vehicles operate in the Bengaluru Metropolitan area as of March 2016. In March 2015, 55.59 lakh vehicles were recorded while a year earlier, the vehicle numbers were 50.50 lakh. 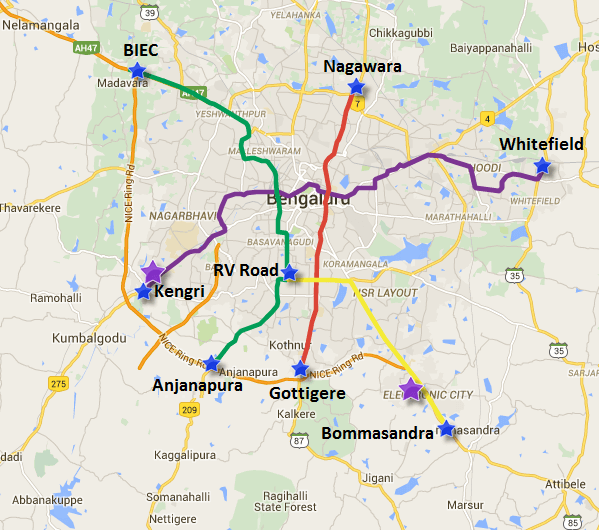 The Bangalore Metro Rail Corporation Ltd (BMRCL) has set out to change exactly that. The inception of Namma Metro in or Bengaluru has made it easier to travel to different parts of the city including outlying suburbs, riding over traffic jams. Once the entire 42 km stretch becomes operational, the ridership is expected to grow from 1.8 lakh to 5 lakh per day. The metro is now used by 7 plus crore commuters using it since its inauguration in 2011. Considering that a good majority of them use it at least 5 times a week, the metro will play a large role in reducing traffic congestion. It also provides those who work far from home with a convenient travel option, as well as an alternative mode of travel during ab/bus strikes. A good example of this was last year’s transport strike the metro helped around 2 lakh commuters travel safely to work as well as get home. The expansion plans of Metro aim to ease traffic on busy roads such as the Outer Ring Road. The proposed red metro line will have three stations—Hebbal, Yelahanka and KIA—with a possible chance of a station near the Manyata Tech Park, an upcoming IT hub. With techies frustrated that it takes an hour just to get out of the Tech Park, the Metro service in the area will definitely improve commuting times. Not only that, the Metro service will also give residents in the area a quick and convenient mode of transport to reach the heart of the city. The proposed new metro line and stations will be in close vicinity to areas like ORR, Nagavara circle and Thanisandra main road, allowing upcoming housing projects to be well connected within the area as well as to places like MG Road and the airport.